Thank you so much to all of the amazing couples, families, industry professionals I have had the honor to work with! Within the first few minutes of meeting with Chelsea, I knew we had made the right decision in hiring her to photograph our wedding. As a very sentimental person, I wanted to ensure we loved the lasting photos of the celebration, so finding the right photographer was one of my biggest planning priorities. We found Chelsea through an online search, and of all of the galleries we explored, hers stood out for a few reasons. One was her ability to pick out beautiful backgrounds and create interesting compositions. Our wedding was in Milwaukee, so I wanted to make sure she was able to capture shots that reflected the city's character, and her work made me confident that she could. Secondly, her pictures seemed to beautifully capture the personality of the couple's and the vibes of the events. In person, Chelsea is better than I could've hoped! She put us immediately at ease, and I was impressed with the ideas she had for locations and set-ups during our initial meeting. I left knowing that we were in good hands (and feeling like we had made a new friend!) Chelsea's people skills were so helpful the day of our wedding, too! All of my friends and family thought she was great - as I knew they would - so she was able to establish immediate rapport with the group, which helped to capture excellent and fun candid and posed photos. Beyond her photography duties, it's clear that Chelsea's experience has resulted in wedding day coordination expertise, and I looked to her to help keep the day on track and make sure that all of our pictures (and everything else) happened as planned. She did not let the day's rain showers phase her. Instead, she was quick to come up with locations that worked well despite the rain, and the outdoor umbrella shots were some of my favorite of the day! She was also exactly where I needed her when I needed her, which resulted in Jake and I being able to get some (dry) outdoor photos during a break in the rain later in the evening. And our photos!!! They are stunning, and we couldn't be happier with them. After posting them on social media, I received several comments that they looked like they came straight out of a wedding magazine, and I have to agree. Beyond their beautiful composition, the pictures did an excellent job of capturing our emotions and the spirit of the day. The many photos she snapped of Jake and I sharing in laughter are among my very favorites. So would I recommend hiring Chelsea as your photographer? One million times yes! Hiring her was one of the best decisions we made, and I look forward to working with her again in the future. Chelsea did an incredible job making Greg and I feel so comfortable during our photoshoot! We had so much fun checking out different locations, and she was so helpful in helping us select our outfits and helping us pose in a way that felt natural for both of us. The photos came out beautifully! I couldn’t wait to share them with everyone! I highly recommend her if you’re looking for a photographer who is fun, incredibly helpful, and takes amazing photos! Having Chelsea photograph our wedding was the absolute best decision we could have made for our most special day yet! Working with her from the first moment we met, to the chaos of planning and to getting our wedding photos back was an absolute pleasure! She was so incredibly wonderful at making us feel comfortable behind the camera – a place we are not naturally comfortable. It felt like we had one our greatest friends hanging out by our side snapping pics all day! As for the photos we received – breathtaking! We could not be happier with how she was able to truly capture the love, happiness and joy we shared not only with each other, but also with our family and friends on our wedding day! My husband and I both 100% recommend Chelsea to anyone who is looking for a top-notch photographer! We cannot wait to work with Chelsea again in the future (family photos, EEK!!). I can't say enough good things about Chelsea, and honestly, worry I can't do her work justice with this review. Chelsea is a master at finding and capturing light in her photography. That was one of the main reasons we were drawn to her work when we were looking for a wedding photographer and the shots she got of us in the engagement session did not disappoint! Chelsea also has a great eye for photo composition and finding unique but natural looking shots. During our engagement session she led us into a shrubby / tall grass area near the beach in Milwaukee. Honestly, I thought to myself, “well these shots will be a bit experimental but let’s see how they turn out.” Those shots ended up being some of my favorite photos of the whole bunch, and I don’t think a lot of photographers would have spotted the opportunity there. For all the good things I could say about Chelsea’s skills as a photographer, the highest compliment I can pay to her is that her open and glowing personality creates an atmosphere that brings out the best in her subjects. I don’t consider myself to be a particularly natural subject to photograph, but Chelsea’s open personality made the session feel easy and natural. My fiancé and I laughed and had a great time throughout the whole shoot, and Chelsea captured those moments beautifully. My husband & I are not from WI, but we fell in love with a venue in Racine, so we were way out of our element trying to find vendors, especially within our budget. Chelsea was recommended by a friend of a friend from our dog park. She could not say enough wonderful things about Chelsea, & all the pictures she showed me from her wedding were so perfect. So I spoke via email with Chelsea, & I was already obsessed with her positive energy & how she really wanted to get to know Dan and I, & our story. She was super accommodating & met us at the venue (which was in the middle for both of us). Chelsea’s creativity started flowing, & she was suggesting all these photos ideas. We booked her on the spot. Fast forward to wedding day, & she was on top of everything. She communicated perfectly with the Event Coordinator to make sure we took advantage of every opportunity for pictures & kept on track with our schedule. Everything flowed perfectly for our wedding & of course, all the pictures were wonderful! I could not believe some of the shots she got, whether they were portrait or candid, she caught little moments we will treasure forever! Chelsea is just as described: honest, artistic, and candid. These are her main foci when photographing, and even just gearing up to do so! We picked Chelsea because of a friendship we'd already built during college, but also because we knew we'd be comfortable with her - she's just so down-to-earth, welcoming, and fun. Of course, we also admired her beautiful collection shared via various platforms (her website, social media, etc.). Chelsea's willingness to travel both to photograph our engagement (WI to TX) and our wedding (WI to MA) sealed the deal! Throughout the whole process, we loved working with Chelsea and would surely choose her if we could do it all again! Chelsea was absolutely phenomenal at our June 3rd wedding in Chappaqua, NY! She was kind, responsive, and lovely to work with, and was the best photographer we could ask for the day of! We did an engagement shoot with her as well and she made us feel so comfortable and natural. She has a way of providing direction that makes you feel comfortable, and not awkward (even if you are)! Her second photographer at the wedding, Jenna, was also fabulous. She was warm and friendly, and has the same ability as Chelsea to direct us to get a better picture while still letting us feel like ourselves. Jenna went above and beyond when my flowers came with huge, hot pink ribbons on them (that I didn't want!) and she used the extra fabric from my wedding gown to wrap each of them - amazing! We were also running behind schedule for our first look and other pictures before the ceremony, and Chelsea and Jenna helped us prioritize photos so that we could still finish on time. And, of course, the photos are beautiful! They helped make us look like the best version of ourselves! I can't say enough good things about Chelsea and would highly recommend her to anyone! Chelsea was an absolute dream to work with! From the contract signing stage to the delivery of the photos, Chelsea was always available for questions and an absolute professional. Chelsea (and her second photographer) captured our wedding day exactly how we wanted it- without having to dictate exactly which photos to take. We put ourselves in the hands of a professional, and got exceptional results. It's now almost 5 months after our wedding and I find myself looking through the gorgeous photos at least once a week! Chelsea is an amazing photographer and awesome person! She photographed our engagement shoot in downtown Milwaukee, WI and we couldn't be happier with the results! My fiancé and I were a bit nervous and anxious beforehand, but Chelsea made us feel extremely comfortable and at ease throughout the shoot. We cracked jokes and laughed almost the entire time. I couldn’t believe how much fun it was! We really appreciated that Chelsea took the time the research all the areas of the shoot earlier and had beautiful spots picked out. She was able to capture beautiful, authentic moments that told a story, which was very important to us. It is very evident that Chelsea absolutely loves photography and is extremely passionate about what she does. She was so generous with her time and stayed longer to catch photos of the sun setting behind us! 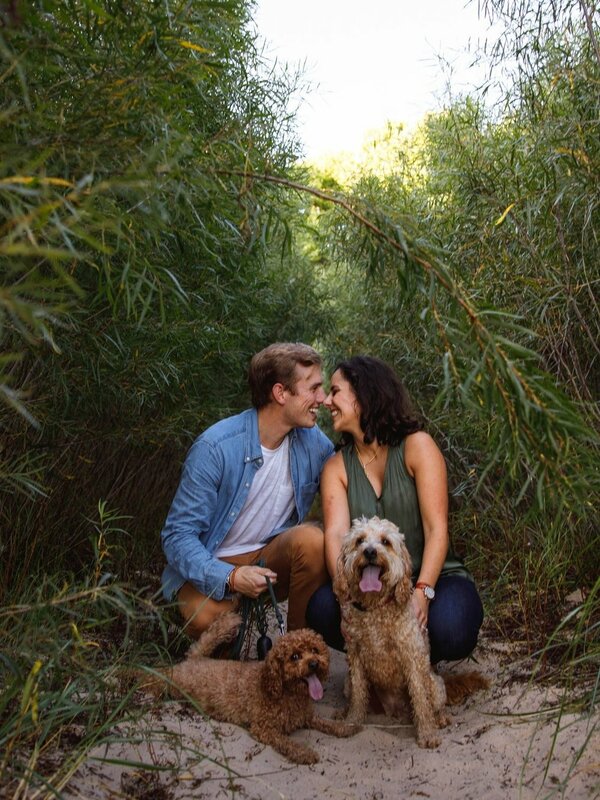 We are beyond excited that she will also be shooting our wedding as well!